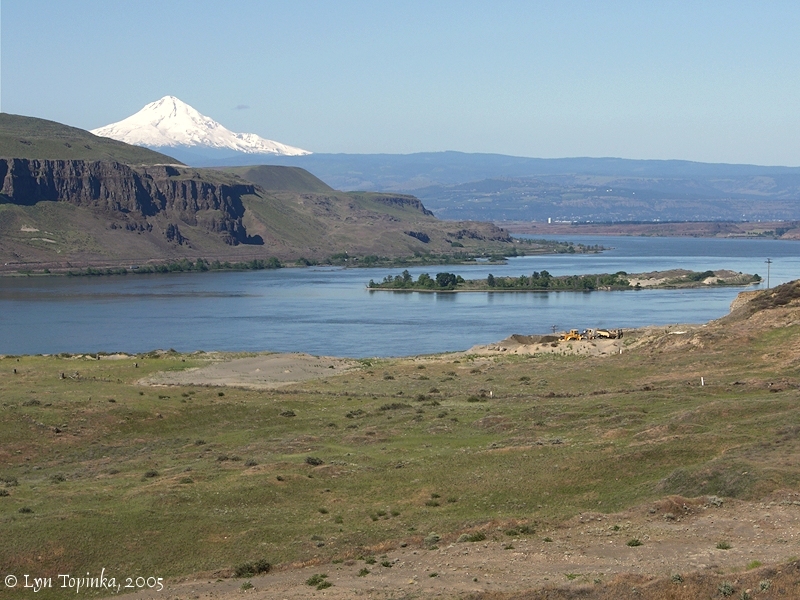 Click image to enlarge Lake Celilo, looking downstream towards The Dalles. Mount Hood, Oregon, and Horsethief Butte, Washington are visible. Image taken April 24, 2004. Lake Celilo is the 24-mile-long reservoir behind the The Dalles Dam. The Dalles Dam was completed in 1957, and the rising waters of Lake Celilo inundated Celilo Falls, plus the "Long" (Fivemile Rapids) and "Short Narrows" (Tenmile Rapids). Good views of Lake Celilo can be had from driving Interstate 84 in Oregon or Highway 14 in Washington State. 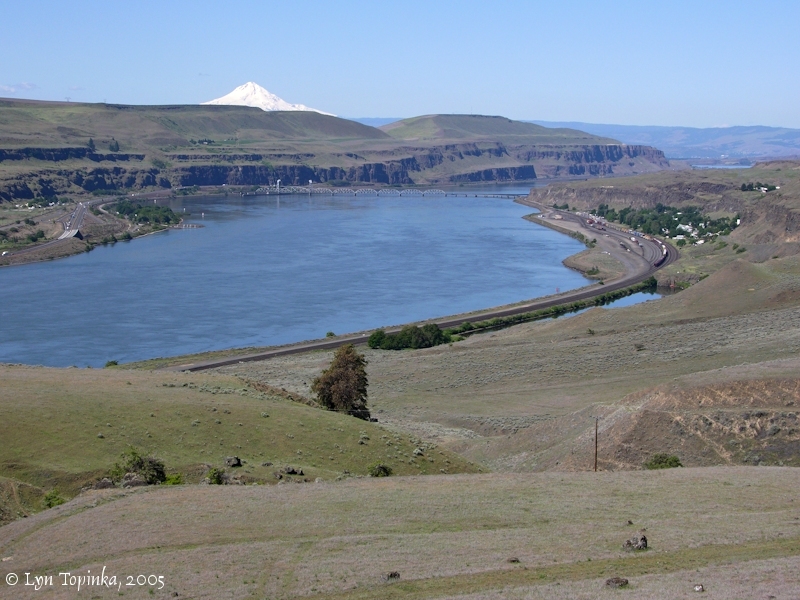 Celilo Park, located at milepost 97 off of Interstate 84, was once the location of the upper end of the The Dalles - Celilo Canal, also under the waters of the reservoir. There are 4 dams and 4 reservoirs on the Columbia River within the scope of this photographic journey. Bonneville Dam and Bonneville Reservoir are the furthest downstream and located the closest to Portland, Oregon and Vancouver, Washington. Bonneville Dam is located at Columbia River Mile (RM) 146, and Bonneville Reservoir extends 46 miles upstream. At RM 192 is The Dalles Dam and Lake Celilo. Lake Celilo extends for 24 miles. Next in line, beginning at RM 216, is the John Day Dam and Lake Umatilla. Lake Umatilla extends for 76 miles. 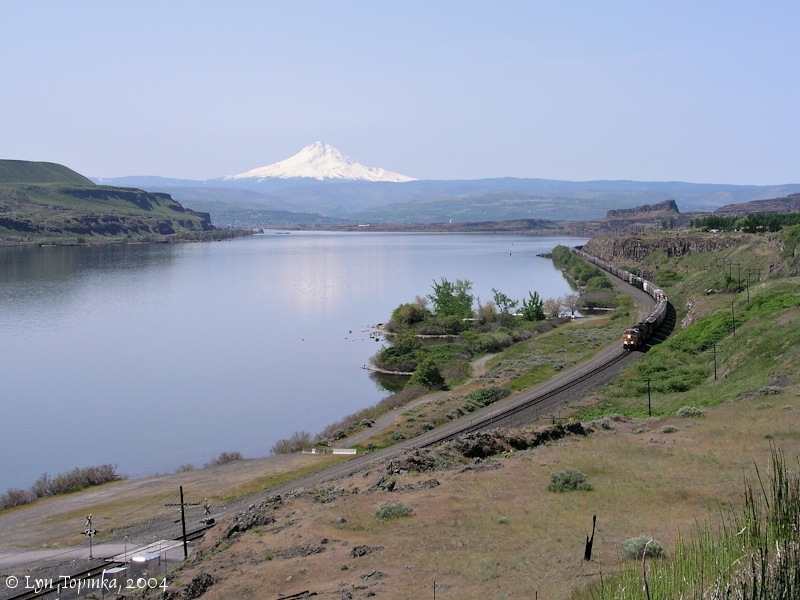 Furthest upstream is McNary Dam and Lake Wallula which begins at RM 292 and extends 64 miles upstream and includes the Tri-Cities of Richland, Pasco, and Kenneweick. 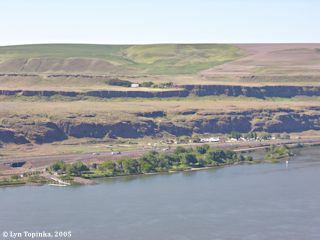 Click image to enlarge Celilo Park and Celilo, Oregon, as seen from Washington State Highway 14. Image taken May 24, 2005. Today's Celilo Park looks over the area which once was Celilo Falls. Celilo Park was also the upper end of the The Dalles-Celilo Canal. 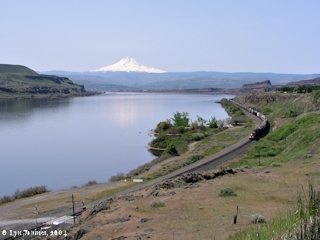 Click image to enlarge Wishram, Washington, with Mount Hood, Oregon, in the distance. View from Washington State Highway 14. Celilo Park, Oregon, is on the left shoreline. Image taken May 24, 2005. 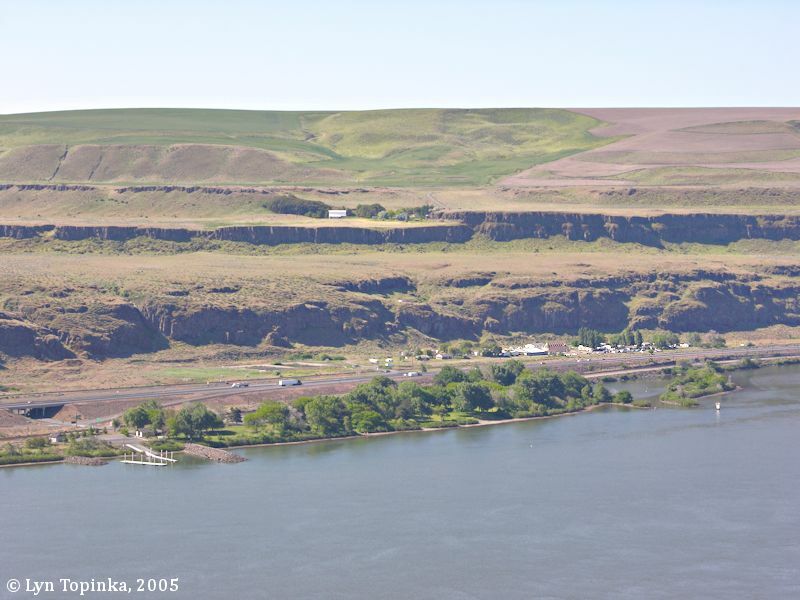 The filling of Lake Celilo not only inundated the impressive Celilo Falls, but also two difficult stretches of the Columbia River often referred to as the "Long Narrows" and the "Short Narrows". The "Long Narrows" was known as the Fivemile Rapids, with it's foot at today's Spearfish Lake and it's head downstream of Horsethief Butte. The "Short Narrows" or Tenmile Rapids was the channel which passed Browns Island, which was not an island at the time. Click image to enlarge Browns Island with Mount Hood in the distance. View from upstream on Washington State Highway 14. 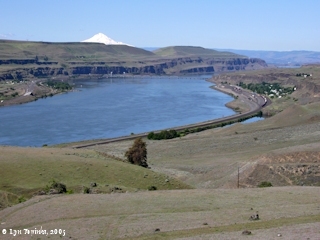 The location of the "Short Narrows" or "Tenmile Rapids" was on the Oregon side (left in image) of Browns Island. Image taken May 24, 2005. A fine morning calm and fare we Set out [downstream of the John Day Dam] at 9 oClock passed a verry bad rapid [today the location of the "Sam Hill Memorial Bridge", U.S. Highway 97 crossing from Biggs Junction, Oregon, to Maryhill, Washington. The rapid, which was labeled "Five-Mile Rapid" in 1858, is now under the waters of the Lake Celilo, the reservoir behind The Dalles Dam.] at the head of an Island close under the Stard. Side [??? ], above this rapid on the Stard. Side is Six Lodges of nativs Drying fish [Maryhill vicinity], at 9 mls. passed a bad rapid [Deschutes Rapid, also under the waters of Lake Celilo] at the head of a large Island [Miller Island] of high, uneaven [rocks], jutting over the water, a Small Island in a Stard. Bend [???] opposit the upper point, on which I counted 20 parcels of dryed and pounded fish; on the main Stard Shore opposit to this Island five Lodges of Indians are Situated Several Indians in Canoes killing fish with gigs [Haystack Butte, Columbia Hills, vicinity], <and nets> &c. opposit the center of this Island of rocks [Miller Island] which is about 4 miles long we discovered the enterence of a large river on the Lard. Side [Deschutes River] which appeared to Come from the S. E. - we landed at Some distance above the mouth of this river [Deschutes River] and Capt. Lewis and my Self Set out to view this river above its mouth, as our rout was intersepted by a deep narrow Chanel which runs out of this river into the Columbia a little below the place we landed, leaveing a high dry rich Island of about 400 yards wide and 800 yards long here we Seperated, I proceeded on to the river and Struck it at the foot of a verry Considerable rapid [Deschutes Rapids], here I beheld an emence body of water Compressd in a narrow Chanel of about 200 yds in width, fomeing over rocks maney of which presented their tops above the water, when at this place Capt. Lewis joined me haveing .... at about two miles above this River appears to be confined between two high hils below which it divided by numbers of large rocks, and Small Islands covered with a low groth of timber, and has a rapid as far as the narrows three Small Islands in the mouth of this River, <we returned> this River haveing no Indian name that we could find out, except "the River on which the Snake Indians live," we think it best to leave the nameing of it untill our return [Deschutes River].